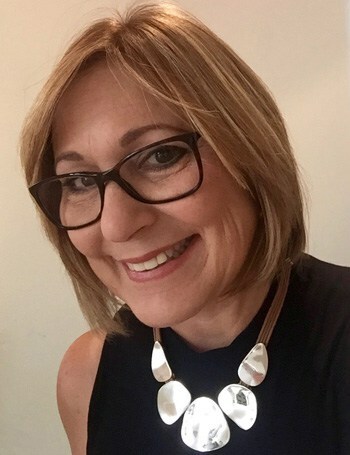 Our next interviewee is a designer with a loyal following in South Florida’s Gold Coast, where she has built a huge network of enthusiastic clients that have become her brand ambassadors. 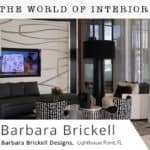 Based in Lighthouse Point, north of Fort Lauderdale and south of Boca Raton, the talented interior designer Barbara Brickell of Barbara Brickell Design provides luxury interior design services to an elite clientele. Her clients have long touted her luxury yacht interiors. Her fellow designers have known her as the go-to source for sophisticated custom window treatment design and automation. Yet, it is her luxury home designs which is starting to get her noticed outside of her sunny region. When I was looking into her South Florida design studio, I found her client reviews were consistently praising her capacities. "(She) is an absolutely wonderful interior decorator." Having won the hearts and trust of her clients, I just had to learn more about her life as a designer. So, without further ado, please welcome Barbara! Q: I am so intrigued by how you got into yacht design. What opened the doors to that? Barbara: My husband and I were boaters some years ago which brought us to buying a home on the intercoastal waterway in Lighthouse Point. Living on the intercoastal is a lovely experience, and here one is always surrounded by friends and families with yachts. My neighbors have beautiful luxury homes designed by talented designers. Their expectations on design are high and they expect nothing less than a sophisticated interior for their yachts. Thus, it has become the norm for them to redesign the interiors to take things up a notch. And, fortunately, I was given the opportunity to do the designing for many of them. Once my yacht designs were seen by other yacht owners, the demand for my services grew, and I became quite busy working on this specialty. I find it exciting to design these interior spaces to reflect my clients’ lifestyles. Often people think of yacht design as being a bit generic or templated, but that is only when the owner doesn’t work directly with the designer to make it perfectly fit their needs, tastes, and lifestyle. A well-designed yacht can be as personal as a well-designed home. Q: While most of your residential work is for full-service luxury design, as well as kitchens and baths, you are known for your particular aptitude for designing custom window treatments and motorization. How did you develop your window treatment craft? Barbara: I noticed there is a gap between design work and specializing in window coverings. I find myself naturally interested in motorization not just of shades but of all window coverings. I specialize in products knowledge and design application. 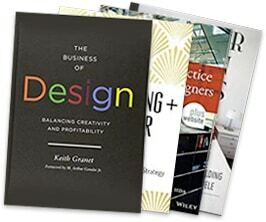 I am proud to partner with other professionals in the design industry. I work closely with the designers to implement their ideas and pay close attention to details management and installations. 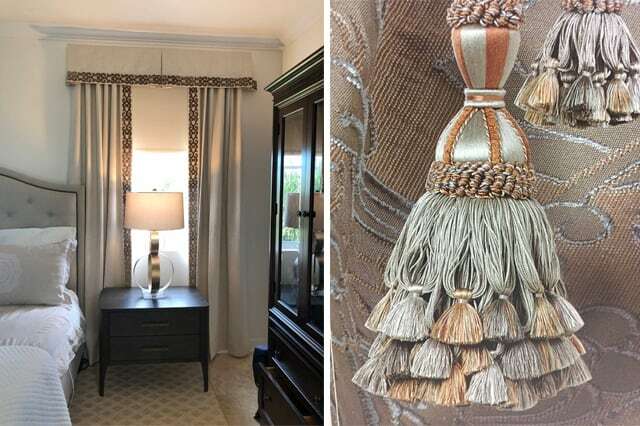 Specialist in textiles and understanding the materials used for the proper drapery application makes it beneficial for other designers to work closely with me and their window treatment projects- commercial or residential. 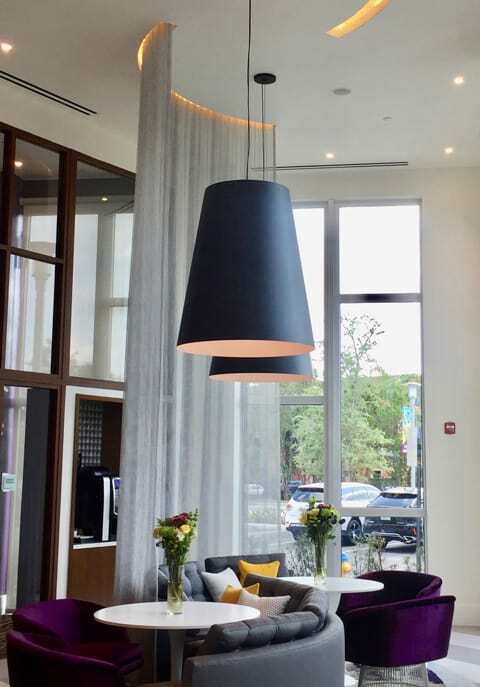 Whether the project is modern or traditional style, residential or commercial, my aptitude for this process has brought me to work on not just Florida projects but also projects in New York and Vermont. Q: Can you explain a bit about how you found your calling in interior design? Barbara: I was born and raised in Manhattan, the heart of New York City. Since I was a little girl I just loved decorating. I have memories of being 13 years old and when my mother got home from work I had removed a panel that was blocking off a 1900’s Victorian pocket door in our apartment. No one knew it was there—but I did! I was intrigued by interior spaces and was always moving furniture and accessories around. It simply called me to interact with it and improve it. I spent my weekends in the museums. I became so inspired by history and art, and eventually ended up majoring in Art and Textiles at the Fashion Institute of Technology. In my 20’s, I moved to South Florida where I spent many years working with talented designers at successful designs studios. So, my entry into interior design was from my passion, my education on art and textiles, and then everything I absorbed while working with other designers. 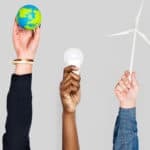 Q: You have achieved a regular supply of new client projects over the past two decades without doing any of the marketing legwork that others solely depend on. How did your existing clientele find you without your name and project photos being advertised in print or online? What is your secret to getting referrals? Barbara: There is really no secret. Most of my clients come through word-of-mouth recommendations because I work very closely with my clients and make sure that we have good communication with each other. I guess it's my personality—I’m very down to earth with them and not pretentious. Also, I select them as well as they select to work with me. So, it was a two-way process that ensured the right fit before we even began. Many of my friends are also my clients, and many of my clients have become my friends! Interior design is a business that grows through trusting relationships. Q: What is the state of South Florida design? Barbara: Outdoor entertaining is increasingly bringing the interior of the home outdoors. We are seeing a lot of inspiration from tropical islands- the whole relaxed, chic, cool, and casual look, whether the style is modern or traditional. I also see large windows with light sheer drapery fabrics creating a soft and elegant look. Finally, also trending are natural tones or bold color prints on accent fabrics. Q: Is there a different expectation on style from residents versus snowbirds? Barbara: My experience with snowbirds is they want their homes to reflect the Florida lifestyle and not their home up north. The weather and lifestyle that residents and second homeowners are much the same, so the styles that appeal to them are quite similar. Q: And lastly, can you tell us about an exciting recent or current design project? 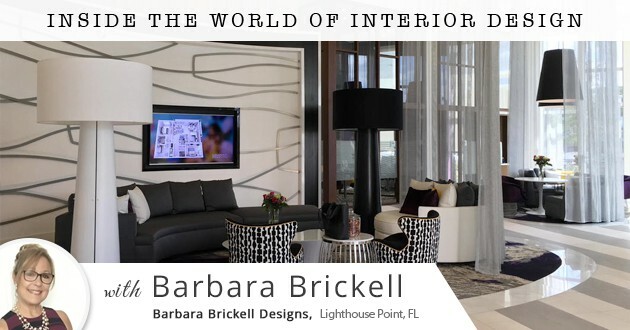 Barbara: My most recent design project is in the Royal Palm Yacht & Country Club in Boca Raton. The house is 8,258 sq ft, so there is certainly plenty to be excited over! This project is a repeat client. I had previously decorated there home in Delray, probably about 10 years ago. So, it is great to be working with these clients again. I enjoy keeping good relationships with my clients and that is what gives me the privilege of getting repeat business from them. The Boca Raton home is certainly a challenging project. The home is modern eclectic and not your average style. I would say it is a bit eccentric. 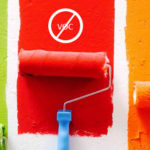 Out-of-the-box designing is always a unique experience with its own set of challenges and rewards. That certainly sounds like a fascinating project, Barbara! Thanks so much for sharing your time with me and allowing my readers to get an inside look into your world of design. Your stories will stay with me—from your discovery of that Victorian pocket door in your Manhattan apartment to my imagination of being on the intercoastal gazing at the magnificent yachts. And, that large eclectic Boca home, I can’t wait to see the photos! I appreciate that little journey you provided and really look forward to seeing more of your work in the future. 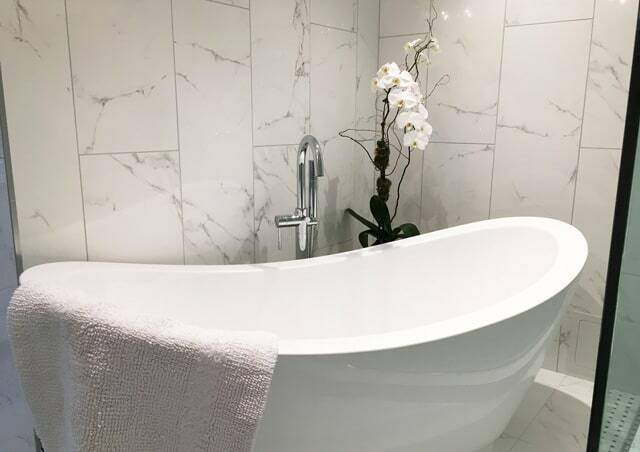 For anyone who wants to start following Barbara on social media, I definitely recommend following her on Houzz as well as keeping up with her latest projects on Facebook, Pinterest, and Twitter. 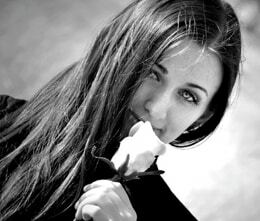 And, if you follow her on Instagram, she promises to start posting more of her work once she gets her latest projects professionally shot.